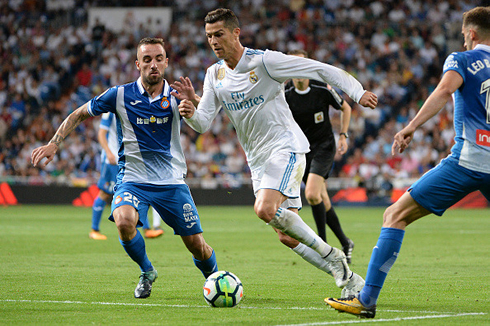 Real Madrid were finally capable of wrapping up the 3 points at the Bernabéu in La Liga this season, after hosting and beating Espanyol by 3-0. The man of the match was Isco, who scored a precious double that allows Real Madrid to not sit at 5th place in the standings. 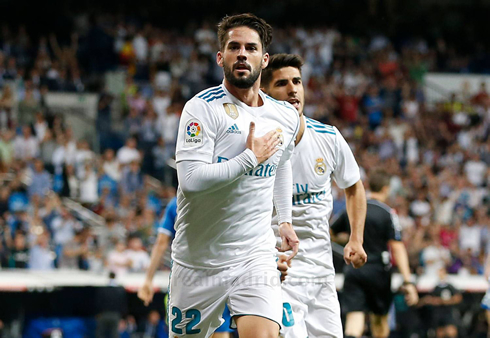 As tensions across Spain were at fever pitch regarding the Catalonia referendum, back in the capital and on the pitch, it was Isco who stole the show for Real Madrid with a double to give the Merengues their first home win of the current La Liga campaign, a 2-0 victory over Espanyol. In the wake of the news about Dani Carvajal's viral infection of the heart that will keep him sidelined for the next six weeks at least, it was a somber mood at the Bernabeu. Some things are bigger than football and though Carvajal is likey to be fully healed if he rests properly, it was still a stark reminder. On the pitch, Madrid seemed to learn their lessons from earlier games and pushed ahead early for the goal and in fact, in the first-minute Isco should have put Madrid ahead after a long ball fell into his path. However, the Spaniard failed to convert his finish one-on-one with Pau Lopez. But Isco would more than makeup for that early faux-pas in the rest of the match. It's clear he's growing in confidence by the game and he bossed the match today. His first goal came after some excellent work from Ronaldo on the wing. Running inside and drawing all the attention, he was able to play a perfectly timed through pass to Isco. Learning his lesson from his earlier finish, Isco put this one away with a quick toepoke passed the keeper. Despite the goal, things certainly weren't certain as Espanyol grew in confidence as time went on. 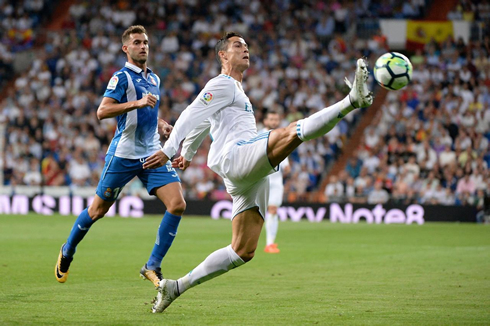 Madrid did have a few more chances to separate themselves... Ronaldo particularly had a close-range shot saved, but alas they would go into the second half with a 1-0 scoreline. In the second half, Real Madrid attempted to turn on the pressure knowing that just one goal would almost doom their league campaign. Barcelona sat 10 points clear before the match and any more dropped points by Madrid would leave the campaign in tatters already. That said, Madrid were able to put in a professional performance in the second half and finish the game off with another goal by Isco. Again, with Ronaldo starting the move, Madrid moved forward on the counter quickly. Ronaldo drew a few defenders before laying off the ball to Asensio. Ronaldo sprinted into the box taking defenders with him, as Isco stood at the top of the box, collected the ball and curled a finish past the keeper. 2-0 and win secure. It was a frustrating game for Ronaldo in particular, despite his contributions. 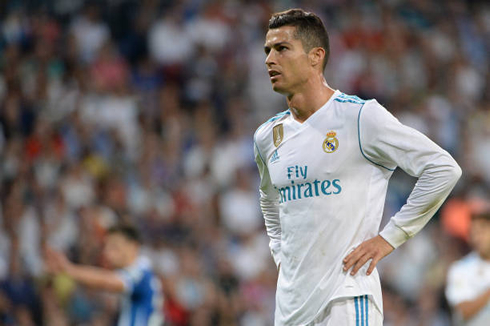 He's still yet to find the net in La Liga (a situation that's surely bothering him), but his all-around play was crucial for Madrid in the final third. It seems Ronaldo's chemistry with Isco and Asensio is a bit off at times, as the two Spaniards tend to look for goals more than Bale and Benzema do at times, but as time goes on, the trio should get more comfortable together. Now we head into the international break hoping to come back with no new injuries, as the bug seems to have bitten us extra hard this year. Attackers: Isco, Asensio, Cristiano Ronaldo. Cristiano Ronaldo next game is for Portugal on October 7 of 2017 against Andorra. You can watch Juventus live stream, Andorra vs Portugal, Bolivia vs Brazil, England vs Slovenia, Scotland vs Slovakia, and Northern Ireland vs Germany, all matches provided from our football live game pages.